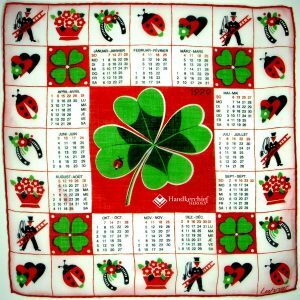 Is luck in the cards for you this year? 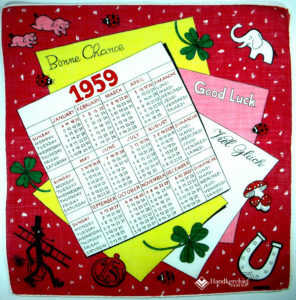 In handkerchief’s heyday, a favorite Christmas stocking stuffer was a calendar hankie proffering best wishes and good luck. 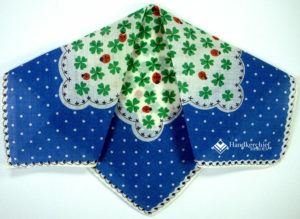 The Swiss German handkerchief above abounds with four leaf clovers and ladybugs. 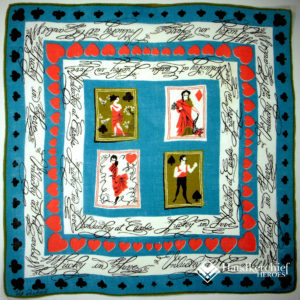 The comely miss needn’t fear having a black cat draped across her shoulders as the cards she’s holding are all Aces! 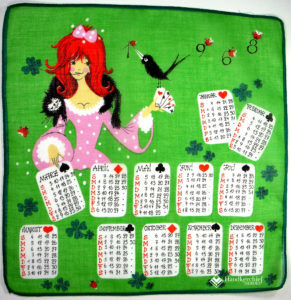 Note how the months cleverly mimic playing cards. 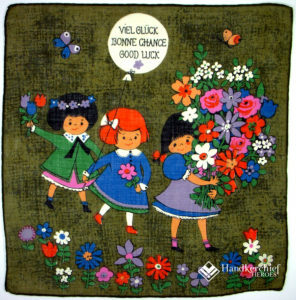 Note fashion hankies were still popular in 1968. 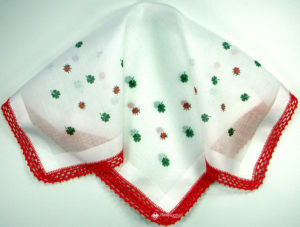 Fanciful hankies were a go-to wingman for conversation starters and flirting. 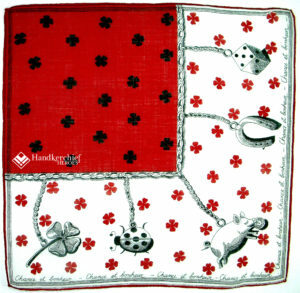 Here’s a cherry red hankie loaded with good luck to carry in your purse all year long. 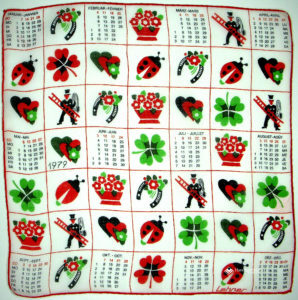 More calendar hankies filled to the brim with good luck. Do you recognize all the symbols? 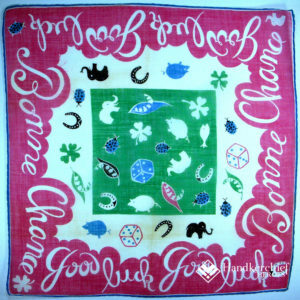 These lipstick hankies feature a chimney sweep bringing “Chance et Bonheur” or “Luck & Happiness”. On the right, an envelope spills forth with time worn bridal traditions (something old, something new, something borrowed, something blue, and a sixpence in her shoe) as the happy couple depart on their honeymoon. A charming image of voyaging lovers, whose friends wish them well with the wave of a hankie. Mais oui, bien sur! 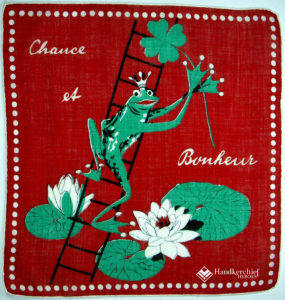 Sweet little girls carry bouquets of good wishes, while the crowned frog clutching a four leaf clover hopes for a kiss to complete his transformation into a handsome prince. He’s such a cutie, we’re certain he’ll succeed. 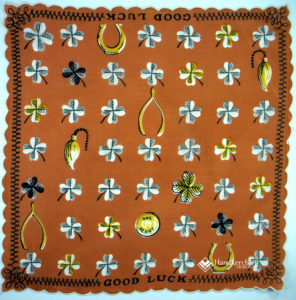 For those who easily succumb to superstition’s spell, we’re here to silence your doubts and dispel your fears with endless images of good luck. 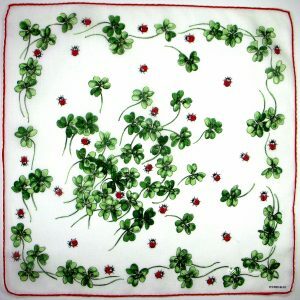 Four-leaf clovers abound on this little gem, and indeed make you want to smile, which may in turn attract good luck. So what’s with all the elephants? Some cultures consider them good luck. The Chinese view them a symbol of strength, wisdom, fertility and longevity. Feng-Shui practitioners claim a decorative elephant should face the front door of the home, allowing good luck to enter. Its trunk should be lifted skyward. Ganesh, the elephant-headed god revered by Hindus and Buddhists is considered the Lord of Good Fortune who provides prosperity and success. He is the remover of obstacles, as well as patron of the arts and sciences, learning and wisdom. Buddha used the white elephant as one of his incarnations, making it a symbol of blessing. What about those bright red ladybugs we see zipping about hither and yon? Legend has it that farmers whose crops were being destroyed by aphids prayed to the Virgin Mary for help. Soon thousands of ladybugs appeared and the crops were saved. Henceforth they were referred to as “Beetles of Our Lady” which evolved into “ladybugs.” The ladybug is still considered good luck for protection against all harm; some say if a ladybug lands on you, it’s a sign you’ll succeed in love, have financial success or receive some other desired wish. 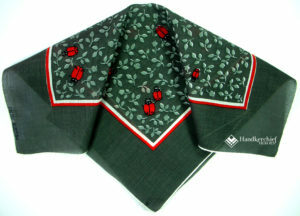 Visually, they’re the perfect accent for this gray and moss green hankie. Couple ladybugs with four-leaf clovers and you double your luck! 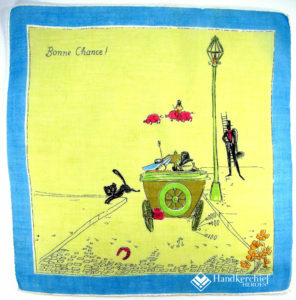 These hankies are deliciously delightful! Irish legend claims St. Patrick utilized the three leaf clover to teach about the Holy Trinity; but what about the four-leaf clover? Some believe it represents faith, hope, love and luck. Just to find one would be seem a stroke of luck, since there are approximately 10,000 three-leaf clovers for every “lucky” four-leaf clover. In addition, there are purportedly more four-leaf clovers in Ireland than anywhere else on earth, thus giving rise to the phrase “the luck of the Irish”. Horseshoes were originally made of iron, a metal believed to ward off evil spirits, and they were nailed in place with seven nails, seven being a lucky number. The religious twist to this legend involves the 10th century saint Dunstan, who worked as a blacksmith before he became Archbishop of Canterbury. Legend has it one day the devil entered Dunstan’s shop and asked him to shoe his horse. Recognizing it was the devil, Dunstan swiftly the nailed the shoe to Satan’s foot, rather than the horse, causing great pain. Dunstan agreed to remove the shoe only if Satan promised he would never enter a home where a horseshoe was displayed. Normally the shoe is placed either on or over the front door. Some believe the ends of the shoe must point upward, allowing the shoe to catch luck in its bowl; others claim the ends should point downward, so the luck will pour out upon those entering the home. 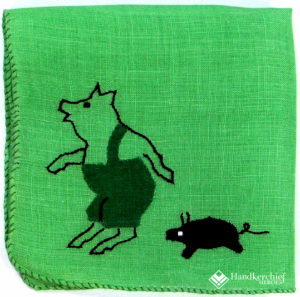 Methinks this pair of Irish pigs must bring good luck. 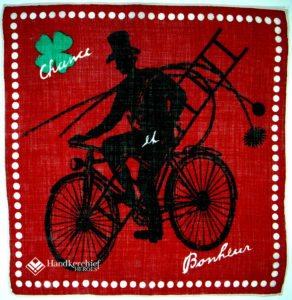 What an engaging example of folk art. 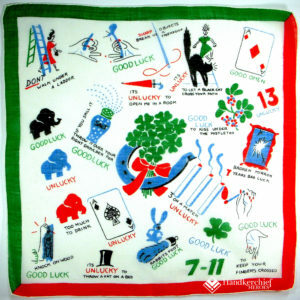 Carry the handsome hankie on the right in your pocket and you’re sure to have a lucky day. And the rabbit’s foot? 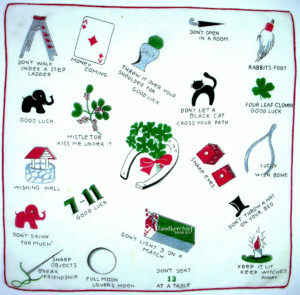 Superstition dictates the lucky charm must come from the left hind foot of the rabbit. Although some historians claim the rabbit amulet exists in cultures from Europe, China, Africa and both North and South America, in the U.S. it is believed to have its origins in hoodoo from the south. This intricately fashioned Victorian charm certainly supports belief in such a talisman. What about the wishbone? Supposedly, the tradition of breaking a wishbone dates back over 2,400 years. Etruscans believed that fowl could predict the future. (hey, that’s why they call it superstition…) Whenever a chicken was slaughtered, the furcular or collarbone was thought to be sacred and was left to dry in the sun. Villagers would later stroke the bone while making a wish. When the Romans embraced the Etruscan custom, fowl were scarce, and in scuffling over the lucky bone, it often broke. The person holding the larger portion was considered lucky, thus the origin of the phrase “getting a lucky break.” Who knew? 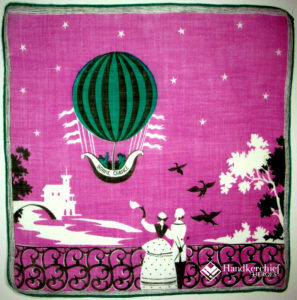 This urbane hankie is up-to-the-minute hip, showcasing good luck charms against a citified backdrop of gray, plum and chartreuse. 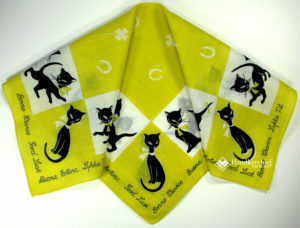 The owner of this hankie is both superstitious and one cool cat. Speaking of cats, this dusky sweetheart is as feminine and feline as Audrey Hepburn, but we know to beware. 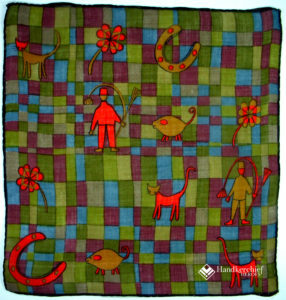 Superstition associates black cats with witches, thus we’re grateful for the neutralizing clovers, horseshoes and border of good wishes in numerous languages. 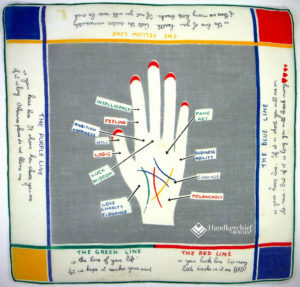 What a great hankie for flirting! 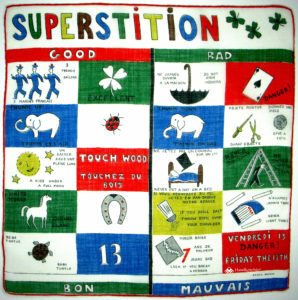 It’s impossible to remember all these superstitions, so here’s a summary of sayings to keep us on our toes. 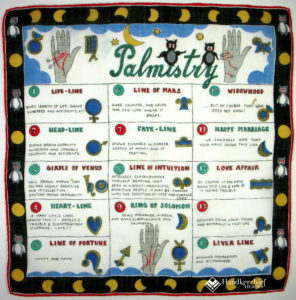 Superstition hankies were great conversation starters and frankly just plain fun, thus many were saved and can still be found today. 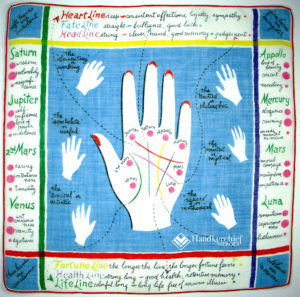 While we’re on the subject of luck, we decided to include some imagery on palmistry and horoscopes. This is not to imply one way or the other we consider these arts to be superstitious. Rather, we are considering them under the all-inclusive umbrella of luck, i.e. there’s the old saying of being born “under a lucky star” etc. 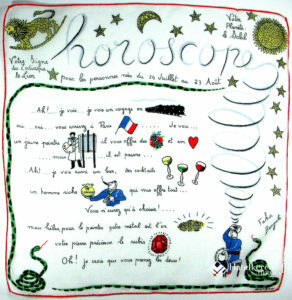 In fact, astrology is a popular subject for handkerchiefs. Not only do some folks rely on these tools to take the temperature of their luck, they’re clever and colorful images and we thought this would be a good place to share them. Whatever route you choose, we simply want to wish you loads of good luck in the year ahead, with ease and joy, and wonderful surprises along the way. On this website under The Accidental Collector tab you’ll find stories of other collectors, including talented jewelry designer Coreen Cordova. 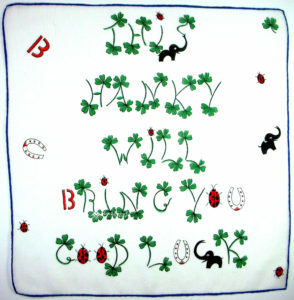 Her offerings include a bracelet loaded with good luck charms (note the elephant, ladybug, four-leaf clover and more). 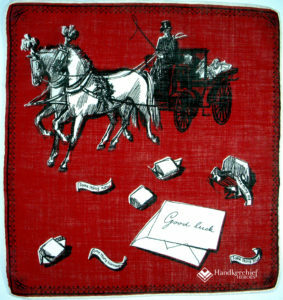 When I spied this hankie, it seemed custom made for her, so I sent it along. 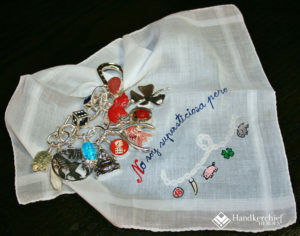 She responded with this image of her bracelet resting on the hankie. It translates: “I’m not superstitious but…..” So whether you boldly walk under ladders or cautiously throw salt over your shoulder…make this the best year yet! May this be your luckiest year ever my friend. Ann your collection is amazing . So many I have never seen. Thank you so much for sharing.